Vienna likes to play musical chairs with its composers. Beethoven’s grave moved, Mozart’s monument moved, and Haydn’s statue was originally intended for another location, too. It now sits majestically in front of the Mariahilfer Kirche on Vienna’s main shopping street. The late 19th century saw a fair few favourite sons of Vienna get monuments in their honour. Haydn’s statue appeared in 1887 and dominates the square in front of the beautiful Mariahilfer parish church that dates back to the 17th century. The monument has a simpler design than the ones for Beethoven or Mozart – essentially just a statue of the great composer looking out over the street with quiet authority. A private sponsorship initiative paid for the costs, and the main sculptor was a man named Heinrich Natter. 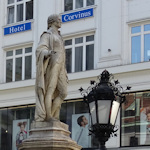 The Haydn monument was Natter’s chief legacy in Vienna, but his work was impactful enough for him to eventually get a street named after him (where my kids used to go to school). The presence of the statue seems to have had a powerful influence on the area around it. The church is known locally as the “Haydn church”, the nearby English-language cinema is the Haydn Kino, and you can probably guess the name of a hotel located in the same building as the movie theatre. Perhaps swayed by its namesake, the cinema often shows live broadcasts of opera and ballet. The location is actually one of Vienna’s busiest, alongside a bustling and partly-pedestrianised shopping street. If you visit Haydn in December, you’ll find him standing serenely among the sounds and scents of a mini advent market, where Christmas shoppers can grab a quick sausage and mug of punch before braving the stores once more. Since it’s on such an important shopping street, the monument is easy to reach. Subway: Just a few metres from the entrance to the “Neubaugasse” station on the U3 line. Bus: The 13A bus passes close by. Get off at either “Kirchengasse” (if travelling north) or “Neubaugasse” (if travelling south).